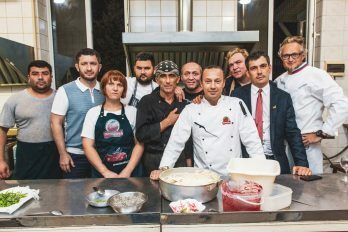 On September 6 – 9, the representatives of Russian media and famous chefs explored the culinary traditions of the North Caucasus as part of gastronomic quest “Tour de Tomat” created and implemented by R.I.M. Communication Agency in Kabardino-Balkaria in the run-up to the 20th anniversary of Pomidorka brand. 12 representatives of Russian socio-political and specialized media (Gastronom, METRO, Kulinar, Komsomolskaya Pravda, Voyazh, Vokrug Sveta, 7ya, etc.) and 4 well-known chefs (Vasily Emelianenko – Brand Chef of Pomidorka TM; Maxim Rybakov – Chef, Suzdal; Denis Perevoz – board member of the National Culinary Association, Chef Consultant and co-owner of the “Recipe of Success“ consulting company; Andrey Kolodyazhny – Chef, founder of the Gastro-Botanica style in Russia (leaf kitchen), a member of the Federation of professional chefs, pastry chefs Russia and the North Caucasus Association) took part in the unique project. Each team received a creative task to cook a dish from local products according to the author’s recipe of the chefs. 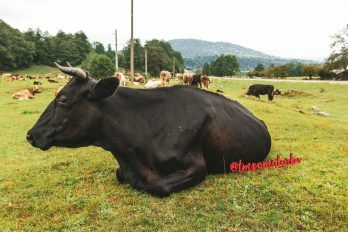 In order to collect the necessary ingredients for cooking, the quest participants visited the most secluded corners of the republic: went down to the Cherek Gorge, tried products from local vendors at markets, fished at trout farm, visited local dairy, tasted wine at a winery. Following the trip, the team of Andrei Kolodyazhny prepared a hors d’oeuvre with three types of tomatoes with verbena and sunflower seeds, the team of Maxim Rybakov—an eastern yak soup. The team of Denis Perevoz prepared trout from local farm, the team of Vasily Emelyanenko pleased the participants with Balkar cream with black sesame ground and mountain honey. Also as part of the culinary adventure, the guests of the capital had an exciting excursion to one of the largest factories of the republic, Agro-Invest LLC, which Desan chose as a reliable partner with good production facilities. Natural tomato paste, tomatoes in their own juice, pickled tomatoes, and lecho Pomidorka TM are produced here. Evgenia Terekhova, Head of the Quality Control Department for Pomidorka TM, said: “Kabardino-Balkaria has humid continental climate, native for cultivation of tomatoes, which allows us to collect fantastic harvest of vegetables throughout the harvest season. The area of ​​tomato plantations is 300 hectares. The factory has three production lines for Pomidorka products manufacturing. We produce 200–300 thousand cans of products per day. 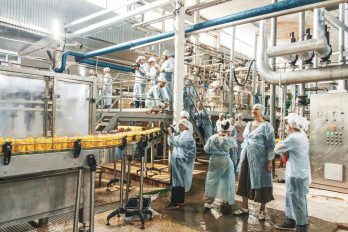 Raw materials and flow production process, as well as careful inspection control by highly qualified employees of the Quality Department ensure the production of high-quality ready-made canned fruits and vegetables – natural, without additives (starch, preservatives, flavours, dyes)”. “As part of this event, we would like to show innovative production of natural tomato paste – a winner of a lot of tastings and “blind” tests among buyers. Kabardino-Balkaria inspired all participants of the gastro-quest to create author’s recipes, which will be included in the illustrated cooking book “Pomidorka”. The book is scheduled for publishing at the end of autumn,” said Yulianna Ivanova, Brand Director of Pomidorka TM. Development of the original concept of the press tour and its holding was another event held for TM Pomidorka in 2018 by R.I.M. Communication Agency, aimed at popularization and strengthening of the brand positioning on the Russian market of natural food products. 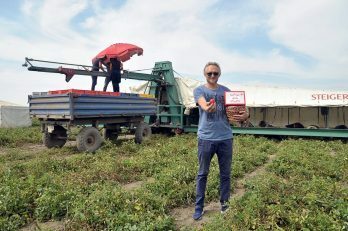 Journalists harvesting tomato plantations of Pomidorka TM.